Students start with a donated bike that needs some repair. As they repair the bike with the skills they are learning they are also gaining agency and ownership. Participants typically learn to fix flat tires, change chains, adjust and replace brakes, complete bicycle safety checks and cleaning! The social skills taught at Open Roads are developed from an evidenced-based program called Skillstreaming. Students are taught one new social skill each week. Each skill is broken down into basic steps that all students can learn and demonstrate. Some of the skills we focus on include: introducing yourself, expressing yourself, asking for help, self-control, and apologizing. R – Respect: Show kindness to other people in the program. O – Own your actions: If you do something great or make a mistake, own it! A – Attitude counts: Stay positive while working on your bike. D – Discipline: Finish what you start. S – Safety: Always wear a helmet! 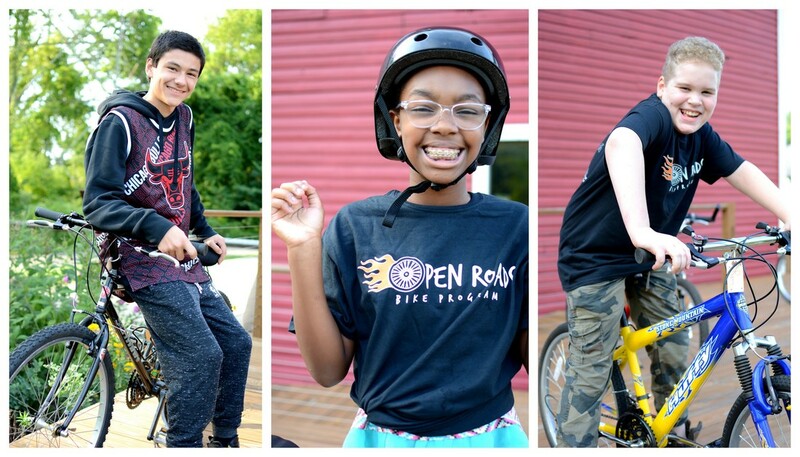 * We have generous donors who have made FULL SCHOLARSHIPS 100% possible for the Earn-a-Bike program. The suggested fee for this six-week program is between $15 and $150. When registering, simply select the financial choice that works best for your family: A Full Scholarship, A Partial Scholarship, or $150. ​Earn-a-Bike program with your class, youth group, or after school program? Groups with students ages 10-18 are eligible. 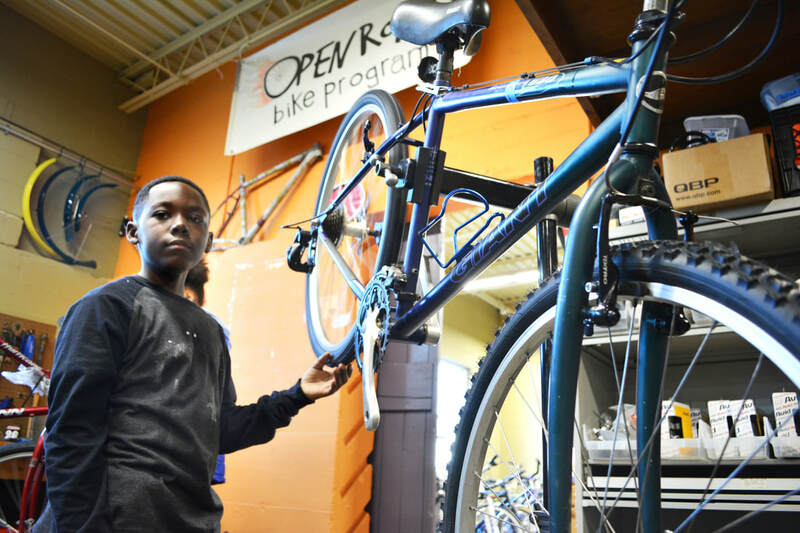 Once students graduate from Earn-a-Bike, 14-18 year olds are eligible to apply for a paid leadership position as a Mechanic Apprentice in our shop or Youth Board Member. When we give students the opportunity to influence other young people and act as leaders for this community- the results are empowered students who feel valued and respected. Do students have to attend all six of the sessions to earn their bike? Answer: Students need to attend a minimum of five sessions in order to earn their bike at the end of the program. If your student needs to miss the first session of the program you must inform our Program Manager in advance, or that spot in the program will automatically go to a student on the waiting list. If transportation to and from sessions is a barrier to attending sessions, please contact us so we can support a solution that works for your family! Do students need to bring anything to their Earn-a-Bike program sessions? Answer: Students should wear or bring close-toed shoes, as flip flops and open-toed shoes are highly discouraged for safety reasons. If your student doesn't have access to close-toed shoes please let us know at registration- we are happy to make proper accommodations. Students will receive a snack, water breaks, and all the other program supplies they might need from our staff team. Please consider dressing for the weather! We often play games and work outside on the back porch, so jackets or long sleeves are encouraged October-April. We have a number of jackets on hand for students to borrow if they show up without one. Can parents stay with their student for the program sessions? Answer: We have a fantastic team of Instructors who are excited to work with your student! The staff to student ratio is 1:4, ensuring students get plenty of attention and support. We prefer parents stick with drop-off and pick-up, although we invite all parents to attend the last day of the program. We do allow parents to stay with their student on a case-by-case basis. If you are particularly concerned about your student's ability to thrive within a small group, please let us know and we will be happy to make accommodations that work for your child. If you are a mechanically-inclined parent and willing to help out other students in the program in addition to your own, we would be happy to have you as an official volunteer for the program. Just plan to notify us in advance so we can prepare our staff team! *If you are hoping to be with your student the entire time, please consider having you and your student attend our drop-in Fixapalooza bike repair clinics. Parents often attend these programs and it is much easier to accommodate parent helpers! What if I have a student between ages 16 and 18, or 7 and 9 who needs to earn a bike? Answer: Students who don't fit in our 10-15 age bracket who need a bike should come to our shop to purchase what we call a "community bike" for between $25 and $60. These are bikes that still need repairs in order to be safe and functional. Once the bike is purchased, that student can come to our shop for Thursday Fix programs between 5-7pm (during the school year) to receive guidance on fixing that bike up and learning the skills to do so. All replacement parts and assistance from our Instructors are free after the initial purchase of a community bike. If a student cannot afford the community bike fee between $25 and $60, we will have them fill out a scholarship fee waiver request in person at the shop. 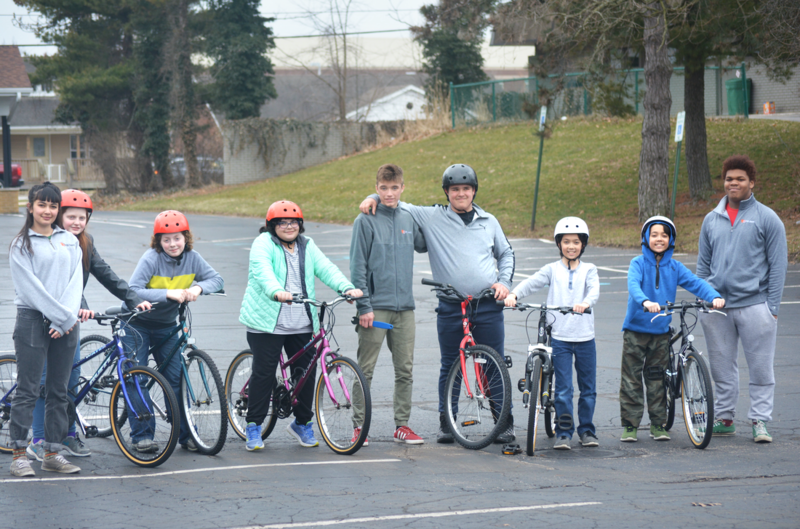 *Students ages 15-18 in immediate need of a bicycle for transportation purposes should contact our office at 269-365-9142.